Fill your kitchen with the rich, magical aromas of a French bakery. Perfect for baking artisanal breads, this ceramic loaf baker ensures that bread retains the ideal amount of humidity while baking. Made from Burgundy clay, each baker provides even, gentle heating and features vent holes that allow excess moisture to escape. Produced one at a time, each piece of Emile Henry cookware is formed and hand-finished by skilled artisans. My first baguette tasted as a real Baguette from the French bakery!! I would definitely recommend this Baguette Maker. Specially because the recipe is included and it is easy to make. A little expensive but the quality is here. Surely beats a baking pan. Just like it always is; the right tool for the job. This is an excellent pan that does just as advertised. 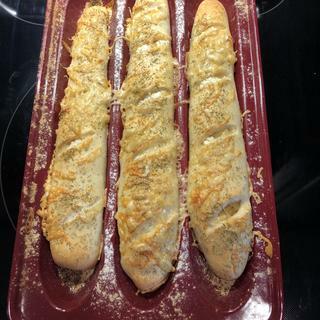 The baguettes I made were excellent. Letting the baguette proof in the pan then baking in the same pan was a nice change to the baguette production ritual of a couche and flipping etc. if you like to make baguettes you will enjoy this pan. I got the Emile Henry baguette baker and it works like a charm! The results are wonderful baguettes, tender inside with large bubbles, excellent flavor and a crunchy crust. Love this baker!!! I just got it and have made two batches of baguettes already. My husband is really enjoying it. He saw the recipe for the Fougasse, got the ingredients and-Voila! 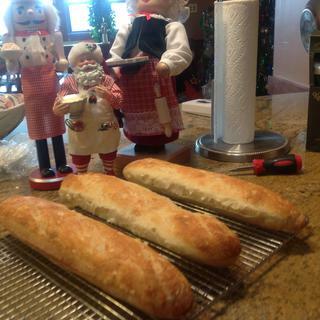 Baguettes are ready in time for the big game:) yum! I bought this for my husband, the bread baker in the family. His first baguettes were perfect! I am a longtime baker and always on a quest for perfectly crunchy exterior, soft holey interior baguette. I have done pretty well without this pan til now so I was skeptical about paying so much for what I considered a "gadget." But I received it as an early Christmas gift so spent yesterday and today testing it out. The results have been amazing. What a treat to not have to deal with the whole "throw ice cubes in the oven" thing to get the proper humidity that creates a good rise with crispy crust. The recipes in the accompanying book for baguette, fougasse and breadsticks all came out beautifully. Only thing I changed the second go round was to increase water to 80% hydration and use folding rather than kneading technique because I am after those big beautiful holes inside - mission accomplished. Wish the pan was a little bit longer to get closer to traditional baguette length but other than that, love this pan. Just out of the oven in all their crispy soft glory! I started to make bread loaves recently and they truned really well. But for baguettes, you need the right tool to succeed, that's why I decided to purchase the baguette baker. I have always longed to make baguettes, but have found most pans are gimmicks. This particular pan comes with high ratings, and many stories of success in baking. It’s ratings were good. I’m very disappointed I couldn’t use a coupon though. Duh...because I want to bake baguettes. I have the bread cloche and it simulates a brick oven with infused water. Crispy crust and tender on the inside. I want to try the french bread cloche. Really looking forward to using this to make homemade baguettes for me and my family! On the hunt for the perfect baguette. Would like to try this. I want to try making french bread and this made it look easy. Plus, I liked the quick video as well. Want to try baking baguettes. I have used the Bread cloche for baking and found it easy to use, so i chose the baguette baker. Love Emile Henry products and want to make bread in more unusual shapes. Our son who loves to bake bread, wanted this item. I own several Emile Henry products and love them. The quality is great. I have sometimes uneven results with baguettes. I can't wait to try this! Family is every excited to make bread at home and wanted to add this tool to our toolbox. Can you make just one baguette or do you have to make three at a time? BEST ANSWER: I’ve never tried to make just one baguette. The recipe I have for a large baguette pretty much makes enough dough for three of the smaller ones that fit in this pan. I would guess that making one baguette and leaving the other slots empty wouldn’t hurt it. For my recipe I place the entire pan in the hot oven to heat up empty with no problem. I’m sure you can make anywhere from one to three. Just preheat the baker and you’ll get a nice crusty baguette. These are not long baguettes, however, so you may want all three. I find a standard bread recipe with 3 cups or so of flour makes three baguettes. Yes, you can bake one loaf in the middle slot. Adjust baking time for less bread. You will eat that single loaf within minutes of it coming out of the oven. You will then bake 2 or 3 more loaves, to have something to serve. I assume you could make just one. My family loves bread, so I’ve always done 3. I use some for dipping into flavored balsamic & olive oil while we wait for the other with dinner. The family loves it! They are not that big so I bake three. You could always give one to a friend. I may try to bake just one. I think it would be fine. Personally I made 3 because you can freeze them if you have too many. I never have...my dough recipe makes 3. I see no reason that you couldn't make one. I see no reason why you can’t make just one. Use the middle space.